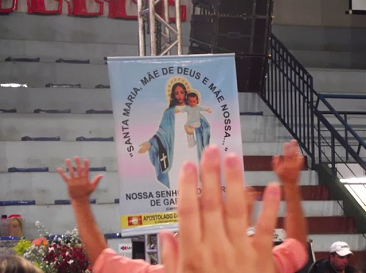 From November 29 to December 8 of 2013, a Mission was held to spread the Message of the Apparitions of Our Lady of Mount Carmel of Garabandal in different cities and towns of Brazil. This was organized by the Catholic Apostolate Infusion of the Holy Spirit, based in the city of Uberlandia, in Minas Gerais. 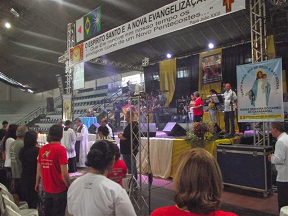 For this mission event and with the permission of Bishop of Uberlandia D. Francisco Paulo Machado, two missionaries were invited: Rui Costa (Portugal Garabandal Apostolate) and Santiago Lanus (Argentina Apostolate of Garabandal). Many meetings were held in different parishes, accompanied by Priests who have welcomed the missionaries with great generosity and attention. The Message of Garabandal was widespread especially in its most essential aspects, namely, the protection and appreciation of The Holy Eucharist (the REAL Presence of Jesus), the Importance of the Priesthood, the Obedience to the Holy Church, and The Maternal Love of The Blessed Virgin who wants ALL Her children to return closer to the Two Sacred Hearts . Taken at the beginning of the meeting. People were singing in front of a painting of Our Lady of Mount Carmel of Garabandal, who at the time of the apparitions had said, "Holy Mary, Mother of God and Our Mother." The close of the meeting. The priest gives the medal that was "Kissed" by Our Lady of Garabandal to the people to venerate. This medal belongs to Santiago Lanus, Garabandal promoter from Argentina. 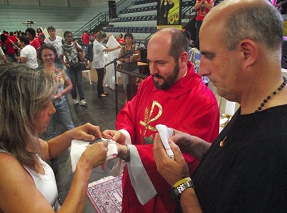 Moment of Solemn Eucharistic Celebration, attended by the Bishop of Uberlândia, D. Francisco Paulo Machado. Closure of the meeting. 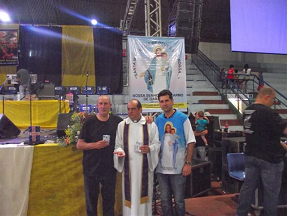 A photograph with Rui Costa (right), Santiago Lanus (left), and Father William (center), in a parish in Uberlândia.